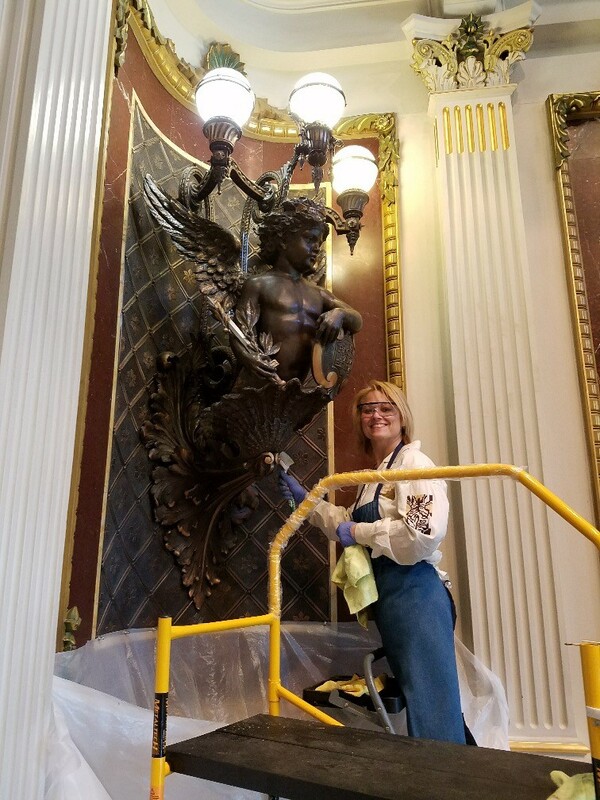 In 2016, The Meridien Group was contacted by GSA’s White House Service Center to assemble a conservation team to address the four Richard von Ezdorf allegorical sconces in the Indian Treaty Room at the Eisenhower Executive Office Building. A “conservation” effort in 2003 saw a heavy dark lacquer applied over the original wax patination, obscuring the delicate coloration and luster of the original installation. Meridien looked to Upton Studios for the conservation work and Citadel DCA for the preservation oversight and construction management. Over six weekends, working Friday through Sunday, Upton Studios team of four conservators meticulously removed the lacquer with mild solvents and bamboo skewers, then restored original patination, finishing the application with Renaissance wax. For the first time in a century, “Industry”, “Peace & War”, “Science” and “Liberty” look as they did when installed in the late 19th century.